Eliminate dandruff and soothe irritation with Sachajuan Scalp Care Collection; a haircare kit that works to restore a healthy moisture balance, whilst leaving hair clean and fresh. 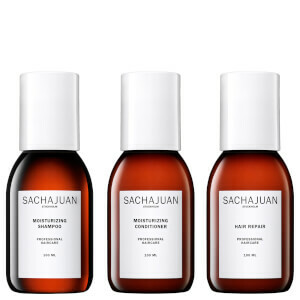 Each formula is housed in minimalistic packaging inspired by traditional brown glass medicine bottles. A lightweight treatment that soothes dry, itchy scalps and helps eliminate flakes. Fortified with Piroctone Olamine and Climbazole, the gentle formula delivers anti-fungal benefits without using excessive toxins or stripping away essential oils. Its delicate blend of Rosemary Oil, Menthol, Salicylic Acid and Ginger Extract helps maintain optimum moisture levels, as it eliminates dirt, oil and impurities to leave the hair and scalp feeling comfortable. A gentle, daily shampoo that works to cleanse normal hair whilst enhancing body and shine. Utilising the brand's Ocean Silk Technology, the shampoo expertly washes away oil, dirt and impurities whilst intensely hydrating and increasing volume. Its stimulating properties help to maintain an optimum scalp environment to promote healthier-looking hair. Hair feels refreshed with improved bounce, body and shine. Powered by the brand's innovative Ocean Silk Technology with natural Algae, the detangling conditioner replenishes long-lasting moisture and hydration, whilst adding body, texture and salon-worthy shine from root to tip. The daily formula delivers nourishing and strengthening properties to leave hair feeling soft, smooth and healthy with improved manageability. Scalp Shampoo: Aqua (Water), Sodium Laureth Sulfate, Cocamidopropyl Betaine, Sodium Chloride, Piroctone Olamine, Climbazole, Hydrolyzed Wheat Protein, C12-13 Alkyl Lactate, Lactic Acid, Butylene Glycol, Zingiber Officinale (Ginger) Root Extract, Salicylic Acid, Menthol, Rosmarinus Officinalis Leaf Oil, Polysorbate 20, Sodium Benzoate, Potassium Sorbate, Sorbic Acid. Normalizing Shampoo: Aqua (Water), Sodium Laureth Sulfate, Glycereth-2 Cocoate, Cocamidopropyl Betaine, Glycerin Peg-4 Rapeseedamide, Hydrolyzed Rhodophycea Extract, Sodium Benzoate, Hydroxypropyl Guar Hydroxypropyltrimonium Chloride, Citric Acid, C12-13 Alkyl Lactate, Trisodium Sulfosuccinate, Climbazole, Piroctone Olamine, Rosmarinus Officinalis Leaf Oil, Sodium Chloride, Menthol, Phenoxyethanol. Conditioner: Aqua (Water), Cetyl Alcohol, Behentrimonium, Chloride, Stearyl Alcohol, Propylene, Glycol, Dimethicone, Hydrolyzed Rhodophycea Extract, Dioleoylethyl, Hydroxyethylmonium, Methosulfate, Glycereth-2, Cocoate, Cetearyl, Ethylhexanoate, Isopropyl, Alcohol, Sodium Benzoate, Climbazole, Piroctone Olamine, Citric Acid, Peg-40, Hydrogenated, Castor Oil, Sodium Chloride, Glycerin, C12-13, Pareth-3, C12-13, Pareth-23, Isopropyl Myristate, Rosmarinus Officinalis Leaf Oil, Menthol, Salicylic Acid, Phenoxyethanol. Scalp Shampoo: Massage into wet hair. Allow 1–2 minutes to work in. Rinse thoroughly. Normalizing Shampoo: Massage a small amount into wet hair. Rinse thoroughly. Conditioner: Massage into clean, damp hair. Comb through the hair gently and leave for 1-2 minutes. Rinse thoroughly.